Welcome to Team Stamp It Groups Christmas Holiday Blog Hop! Whether you hopped onto my blog from one of my teammates or started with my blog, I'm awfully glad you hopped by. I love snowmen and snowflakes, so when I saw the Beautiful Blizzard stamp set with the coordinating Blizzard thinlits die, I knew I had to have it. I started this card with a Whisper White cardbase, the next layer is Highland Heather. I followed that with an embossed Pool Party layer. This layer was embossed using the Blizzard Thinlits die along with the Big Shot Embossing blue silicone mat. The thin blue mat allows you to emboss with thinlit dies and it does not cut the cardstock. By the way, it works pretty slick! 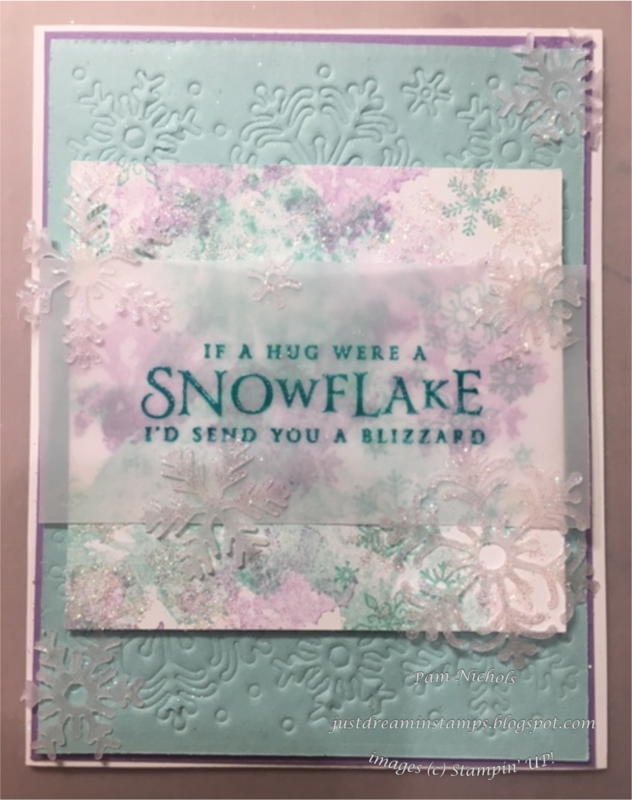 The next panel is Whisper White cardstock that has been stamped with the Beautiful Blizzard stamp set using Pool Party and Highland Heather ink. The snowflakes were stamped in Pool Party. 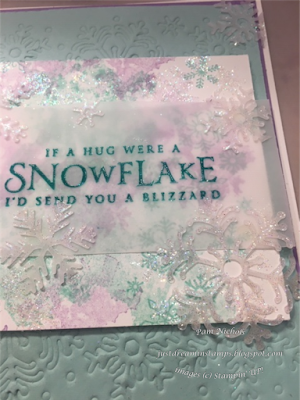 I added some "bling" by stamping the snowflakes again in various locations on the Whisper White card panel using watered down glue as my "ink" and then sprinkled the entire panel with Dazzling Diamonds Glitter, followed by Clear Embossing Powder and heat set it using my heat tool. This panel was adhered to the card front using Stampin' Dimensionals. 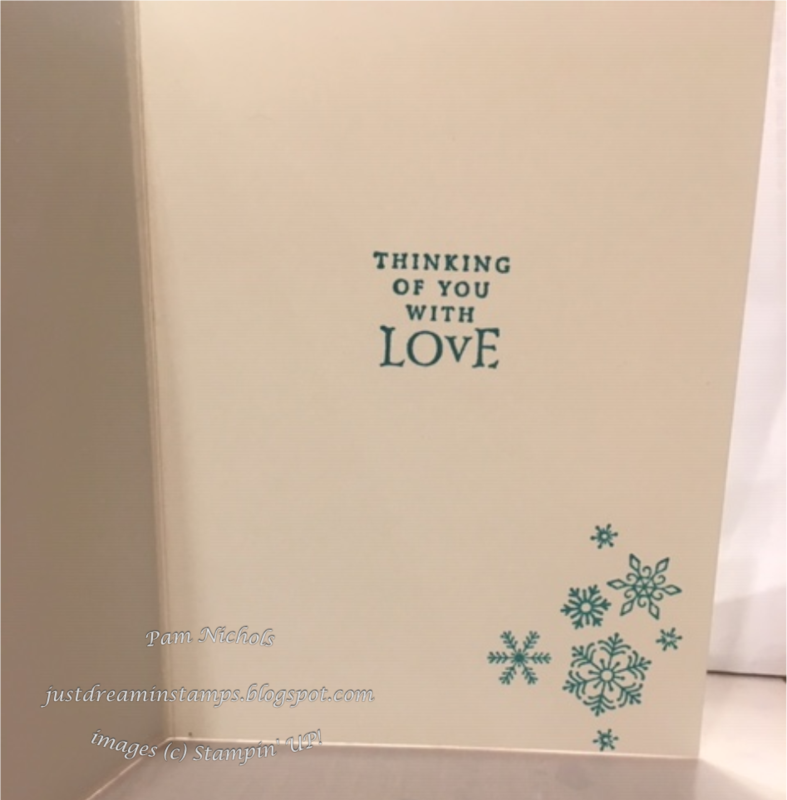 The sentiment is from the Beautiful Blizzard stamp set and was stamped in Bermuda Bay ink onto Vellum paper. While the ink was still wet, I sprinkled it with Clear Embossing powder and heat set it using my heat tool. I adhered the Vellum onto the card front by placing glue dots behind the "w" on snowflake and then in places where I knew I was going to put the vellum snowflakes. 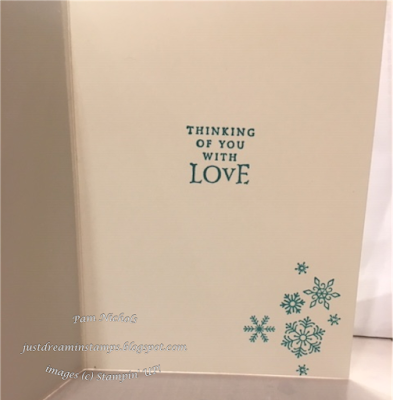 The Vellum snowflakes were made by stamping all over the vellum with the VersaMark ink pad and then sprinkled the vellum with Dazzling Diamonds glitter and Clear Embossing powder. Next I heat set the glitter and embossing powder with the heat tool. Once this was done, the snowflakes were cut out using the Big Shot and the Blizzard Thinlits die. The snowflakes were adhered onto the card front using multipurpose glue. 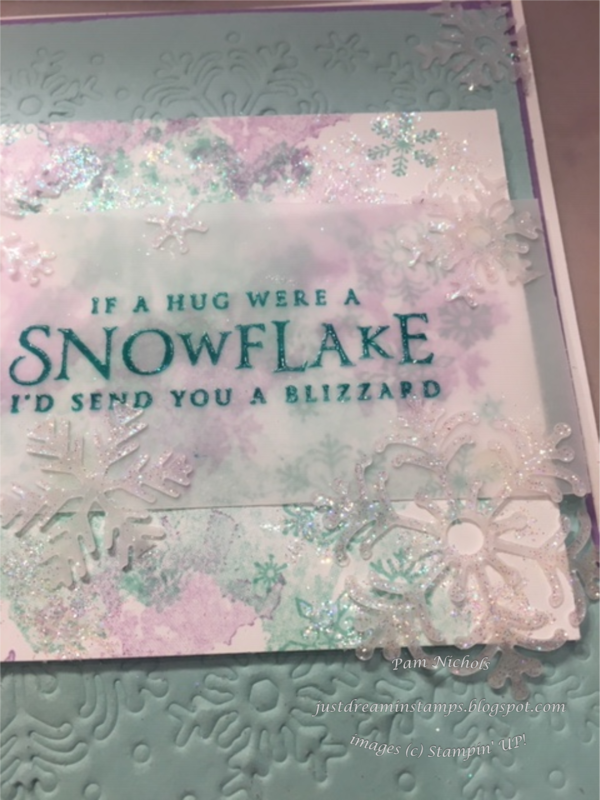 The inside sentiment is also from the Beautiful Blizzard stamp set and was stamped in Bermuda Bay ink. For complete instructions on how to make this card, please click here. Lots of Happiness Card Kit. 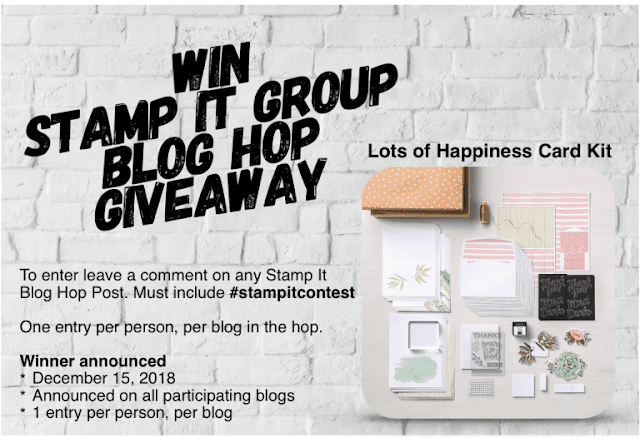 The Lots of Happiness card kit is one of the all-inclusive card kits that are offered by Stampin' Up! and includes everything you need except the adhesive. Hope you and yours have a very Merry Christmas and a Happy New Year!